Traumatic Brain Injuries (TBI) continue to be the number one cause of injury related deaths and disability in Canada. Slip and Fall injuries combined with motor vehicle accidents account for over 55% of all reported cases. Of this 55% roughly 70% report some level of associated fatigue. When the brain isn’t working properly it is harder to concentrate, there is little or no energy for family and friends, sports or hobbies and barely enough for essentials. While most people experience fatigue at one time or another, many brain-injured people, must deal with life draining fatigue daily. Fatigue caused by brain injury occurs when the neural connections in the brain are unable to get messages to the rest of the body. This can affect either physical, mental, psychological functions. There are procedures to discern levels of ability in these functions. Brain injury is not the only cause of chronic fatigue syndrome. It can be caused by many other causes including pain, depression, breathing problems, medication, anemia, sedentary lifestyle and stress. Some of these causes can be tested and ruled out. However there are no accepted testing procedures that prove whether or not fatigue was caused by brain injury. Some fatigue directly results from loss of function caused by the brain injury, in specific parts of the brain. This is called primary fatigue. Even when fatigue is not directly caused by the brain injury, it can occur as a result of stress, discomfort, arising from the brain injury. When fatigue is not directly due to the brain injury, it is called secondary fatigue. In cases of either primary or secondary fatigue, the person may be affected physically, mentally or emotionally. An injured brain has to work harder to do its normal job. Everyday tasks like walking down the street take more mental energy when you must pay attention to each step. People who were able to easily watch a movie and talk on the phone find they must focus on one thing at a time. What was once a full mental calendar has to be written down and checked, with every task. 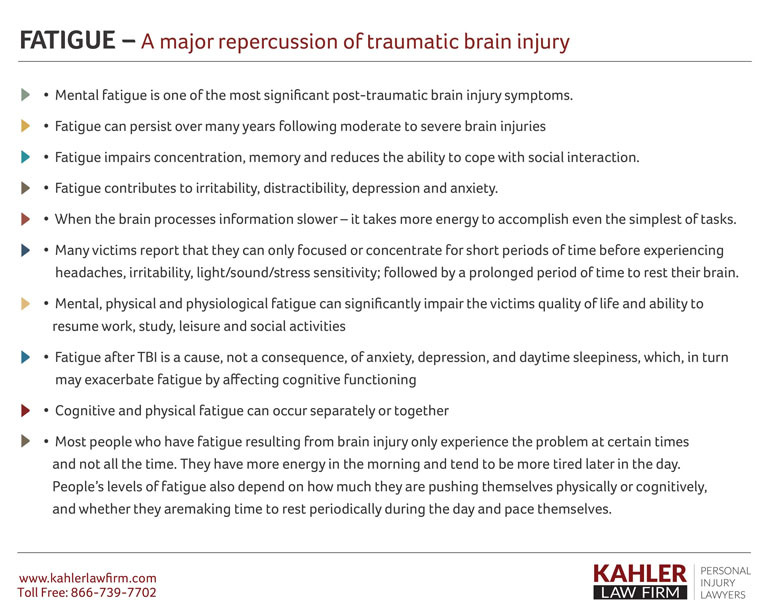 Mental fatigue is a common repercussion of a traumatic brain injury. Many injury victims deal with significant levels of fatigue even after the most modest amounts of mental activity. Many victims report that they can only focus or concentrate for short periods of time before experiencing headaches, irritability, light/sound sensitivity; followed by a prolonged period of time to rest their brain. Someone whose livelihood depends on their thinking and cognitive ability may be unable to continue in their profession or need to severely limit their hours. Even though many are highly educated and qualified they may be let go from their job, due to lack of focus, slow processing and irritability stemming from fatigue. For many, the stimulus of watching television with the family is stressful. Conversations with friends now make them feel edgy and tired instead of relaxed and energized. Because they must make a living, most brain-injured people struggle to go to work in spite of indescribable physical fatigue. It can take tremendous resolve to do even the smallest tasks, like walking the dog or going to the park with the children. The more fatigue they experience, the less they do physically. Most give up home cooked meals and cleanliness for fast food meals and a messy home. The lower quality food, the lower the nutrition. Less physical activity, poor quality food leads to lower endurance and further depletion of already low energy resources. Without relief, prolonged mental and physical fatigue can become a spiraling downward cycle significantly impacting the victims quality of life and leading to psychological fatigue; characterized by anxiety, frustration, anger, poor self-esteem, loss of purpose and guilt. This type of psychological stress is self-sustaining leading to headaches, increased sleeplessness, inability to relax, and depression. The personal injury lawyers at the Kahler law firm are dedicated to aggressively protecting the rights of car accident injury victims throughout Toronto and the greater province of Ontario.